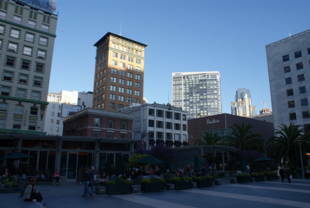 Union Square is a park located on top of a parking lot in downtown SF. It's surrounded by some of the best shopping in the city! Bordered by Geary, Powell, Post, and Stockton Streets, it is 2.60 acres. This park has concessions, and performance spaces as well. 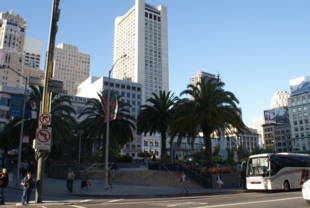 Union Square is owned by the San Francisco Recreation and Parks Department. 2-Clement and 3-Jackson: Post and Powell stop. 30-Stockton and 45-Union/Stockton: Stockton and Geary stop. 38-Geary: Powell and Geary -or- Powell and Stockton stops. **There is a ticket box office on-site that sells half priced tickets for performances. 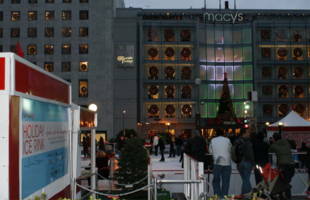 **The site of a temporary ice-skating rink and huge Christmas tree in December. Union Square is one of the most historic and beloved places in San Francisco and one of the most notable urban spaces in the world. Its history is the history of San Francisco and each change it has undergone reflects the greater shifts in the history of our country. Francisco show Union Square and Washington Square as the two then unnamed spaces reserved for public parks. 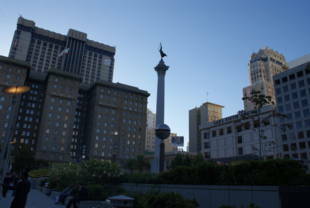 Union Square was named on the eve of the Civil War (1861-5) as a demonstration of support for the Union. churches faced into the square - Calvary Presbyterian, Congregational and Trinity Churches. The imposing 90 foot high Corinthian granite column was raised in the center of Union Square in 1903 and dedicated by President Roosevelt that same year. The monument memorializes Admiral Dewey's naval victory in the Bay of Manila during the Spanish-American War of 1898. It is crowned with a bronze goddess of Victory, sculpted by Robert Aitken, who modeled it after the young Alma de Brettville Spreckels. By the turn of the century, offices and stores gradually squeezed out the residences and churches surrounding the Square. After the 1906 earthquake, Union Square became the center of San Francisco's premiere shopping district. Union Square's present character was established by the construction of the Hotel Saint Francis in 1908. It was, and remains the tallest structure (13 stories) facing the Square, forming an impressive backdrop for the Dewey Monument. Over the years, the park was redesigned many times, but always followed the natural topography of the area, a sloping bowl-shaped space, allowing visual access throughout the whole park from the surrounding sidewalks. With the population explosion in San Francisco in the 1900's and the vast number of automobiles coming into the downtown area, parking in this fashionable shopping district became increasingly difficult. Businesses surrounding the Square worried that they would lose customers due to the lack of parking. The Union Square Garage Corporation was formed and lobbied for years for permission to build the world's first underground parking structure. After going all the way to the California Supreme Court for a decision as to whether the City could lease the land under a public space to a private corporation, permission was finally granted. Three years of research and design followed, and on May 31, 1941, ground was finally broken for the garage and the square as it existed until recently. 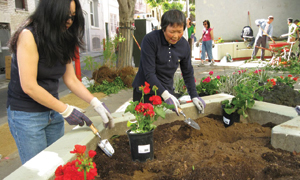 In 1997 the San Francisco Prize Coalition and the City of San Francisco announced an open competition for the redesign of Union Square Park. Called Toward a More Perfect Union: An International Design Competition for the Future of Union Square, the competition received 309 entries from 10 countries and 20 states. The winning entry entitled 'All the Square is a Stage' sought to transform the Park from an imposing, seldom used urban space into an inviting oasis that would be used by all the inhabitants surrounding the area. The design is notable for its easy access, a cafe with lots of open air seating, and a symphony-sized stage that will serve as the center point for a week of concerts celebrating the completion of this project in July of 2002.